David Dimbleby admits to being a member of the IRA and that he was very proud to have worn the ‘uniform’…though he insists he didn’t bomb or kneecap anyone….insisting he had nothing to be ashamed of……he never did the disgusting, disgraceful things that Gerry Adams did. Well no, that’s obviously all untrue…and the BBC would never call Adams disgraceful and disgusting…despite him having been a member of one of the most notorious terrorist groups in the world…and now a respected politician. 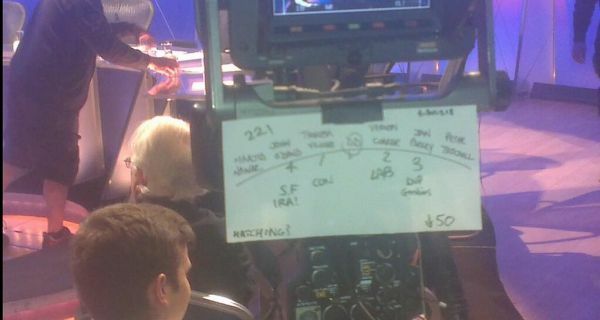 The BBC naturally apologised to a, er, Sinn Fein member for labelling him SF/IRA on a name card at Question time….Sinn Fein….murder, bombings and terror have nothing to do with Sinn Fein ideology. Either David is lying through is teeth or he was completely boring and I hope he got debagged regularly for being so pompous and straight laced. Wiki tells us, as if you couldn’t have guessed, that the Bullingdon has been notorious for a very long time…long before Dimbleby joined up…. Infamously, on 12 May 1894 and again on 20 February 1927, after dinner, Bullingdon members smashed almost all the glass of the lights and 468 windows in Peckwater Quad of Christ Church, along with the blinds and doors of the building. As a result, the Club was banned from meeting within 15 miles of Oxford. It might be noted that all damage is paid on the spot…possibly not always a consolation to the owner of any establishment…but how many ‘working class’ pubs that get trashed are similarly recompensed? Part of the joys of being a student I would imagine…being old enough to go to pubs, have money to spend and the time to sober up with few responsibilities….not as if it’s just the Bullingdon Club students that get hammered….the newspapers are often filled with photos of students in various stages of paralysis and tales of excess…they just aren’t dressed in a fancy suit….fancy dress maybe. Gotta wonder if that colours Dimbleby’s view of the Tory ‘Toffs’ despite himself being TV ‘royalty’. Would the BBC treat anyone else with such contempt….Labour politicians who dressed up as Nazis for instance…I’m certain none of them got up to any hi jinks at Oxford or Cambridge…which of course they all went to as well as the Tories. I am certain, just like David Dimbleby, they were all angels. Just keep bashing the Tories for being rich….despite people in the media probably earning far more than any of them. MI5 has reportedly ‘bungled’, Harry Palmer has failed. There will be no film of this one. MI5 is being accused of allowing the two Jihadis to carry on their lives despite the security services having a good idea about their inclination towards extremism. That maybe…it will come out in due course. But what else might come out of any inquiry? What about the role of the Media, the BBC in particular, in harassing the security services, the police, the military, the courts and politicians whenever they make a move to question, contain, lock up or deport such people. Do the security services hold back from taking action because of fears of the Media firestorm that will engulf them, as well as the well practised Muslim ‘grievance’ industry, especially on occasions when it turns out that although they had some indications that looked suspicious and worth checking they turned out to have innocent explanations. The BBC hasn’t just reported on various cases of extremist Muslims it has interfered in the process of dealing with them…the BBC has frequently ‘campaigned’ by deliberately highlighting these cases and giving them so much airtime to get prisoners released or to limit detention or control orders, against extending the time limit for holding suspected terrorists without charge and to present the case against Guantanamo Bay. Lawyers and civil rights spokesmen such as Clive Stafford Smith have been given massive amounts of airtime and got away without serious challenge to their assertions of abuse or illegal actions by governments. Moazzam Begg’s father must have had his own car parking space at the BBC the number of times he was on air….and all to get released a man who admitted training to be a terrorist. Guantánamo files leaked in 2011 reveal that the Department of Defense had secretly concluded that Begg was a “confirmed member of al-Qaida,” and that he had been an instructor at the Derunta training camp, as well as having attended the al-Badr and Harakat aI-Ansar training camps. Note that Begg and convicted terrorist Dhiren Barot were both radicalised long before 2001 or the Iraq War in 2003….as was Mohammed Sidique Khan of the 7/7 plot. So his radicalisation was in fact to adopt a ‘pure’ form of Islam. Unfortunately, however much some people may want to, you cannot separate Islam from the subsequent Jihadi actions. At the end of the day the security services are under enormous pressure…firstly to stop attacks, and secondly not to make wrongful arrests…being then blamed for discrimination and the targeting of Muslims, leading to a mentality of victimhood and grievance…and then …er…radicalisation….and all to be done with limited resources. The blame is often highly politicised of course, the media targeting certain people. The BBC’s Jim Muir in Lebanon provided us with what I thought was an uncomfortably pro-Hezbollah report this morning on the Today programme (8:32)…perhaps he had some of those Hezbollah ‘minders’ ‘editing’ his report. Justin Webb told us that the leader of Hezbollah, Hassan Nasrallah, gave a speech which ‘horrified’ Syria watchers. Muir didn’t seem too concerned…in fact he seemed quite upbeat about it. Firstly he told us that people have rather overlooked the involvement of Hezbollah in the Syrian conflict. Could that be because the BBC has been rather remiss in reporting that involvement as I have noted before.…Hezbollah were already well known to be heavily involved in fighting in Damascus on Assad’s behalf. If you look at this report from the beginning of May by Paul Danahar, linked to on this morning’s Today ‘Live Page’, there is one thing missing..no mention of Hezbollah…he mentions the ‘rebel’ side’s allies…Jihadists and criminals…oh and denounces Saudi Arabia’s involvement as ‘selfish’….but no Hezbollah nor any such link to Iran or comment about Iran’s motives…merely noting Iran is providing arms to Assad….nothing about Iran wanting to wipe out Israel? ‘The situation has been further complicated by the introduction into the arena of al-Qaeda-linked jihadists and armed criminal gangs. The vacuum created by Western inaction has been filled by two of the Gulf states – Saudi Arabia and Qatar. These are both sorely undemocratic states, they are not champions of democracy either at home or abroad. Saudi Arabia and Qatar are meddling in Syria for thoroughly selfish reasons. Freedom, democracy and human rights have absolutely nothing to do with why they are arming the rebels. Fairly strong attack on the Saudis…why not for Iran as well? Muir in his report, tells us that there is a creeping involvement of Hezbollah….well they’ve been there a long time. He tells us they were there to protect the border villages initially…but they are fighting, and have been for a long time, in Damascus and other strategic towns. We then get to Nasrallah’s speech which the BBC kindly offer large portions of to us…. Basically that Israel and America are behind the attacks on Syria and the ‘Resistance’ will be encircled if Syria falls…Palestine will be lost and the people and states of the region will face a bad and harsh oppressive future…[ with Israel and the Americans in charge]. Justin Webb comes in and says the danger is that Hezbollah’s enemies will get back at them not in Syria but in Lebanon. So just who exactly are Hezbollah’s ‘enemies’? Does he mean those nasty, aggressive Israelis? He might have done. Muir assures us that Nasrallah has done everything he possibly can to head off the possibility of regional war and that he has demanded that the fighting has to stop…Hezbollah won’t allow sectarian fighting to spread elsewhere. Nice to know we have the peace loving (Islamic so must be ) Hezbollah reining in the war mongering Israelis and Americans. Nasrallah, we are told, has promised victory…as he delivered over the Israelis in 2006 Muir says. No gloating from Muir there at all, I’m certain. From the leader of what is a terrorist organisation? This report from the BBC’s Jonathan Marcus gives a much better, not hard to do, perspective on the involvement of Iran and its motivations. A little bit slack from Muir that he doesn’t mention Iran and its involvement with Hezbollah and their intentions towards Israel…giving the sense that Hezbollah are the ‘peacemakers’ in the region…the Today programme is supposedly the prestige, renowned jewel in the BBC’s news output…but so often it provides half the story…and as in this case seemingly half the story from one side of that story…giving the impression of bias…unintended I’m sure. BBC Watch has a look at one of Muir’s reports from a few days ago on the same subject which does detail Iran’s involvement…so why not on the Today programme which has such a large and influential audience?. I actually appeared on the Nicky Campbell hosted “The Big Questions” a few months ago and have to say I found the host to be pleasant and fair minded in his dealing with me. However, I have received a stream of complaints from Biased BBC readers and others concerning yesterday’s edition of the programme. Did you see it? I watched it myself and was horrified at the lack of balance in the audience debating the big question “Have British Muslims gone far enough in condemning extremists.” Essentially, the debate was conducted between Muslims which is truly remarkable given that they make up less than 5% of UK population but more like 100% of the debating benches in this programme. There was NO voice there to posit the view that Islam may well be incompatible with modern western democracies and that British muslims need to accept UK laws and pledge loyalty to the British state. Instead there was a lot of the usual flannel about “British foreign policy” virtually forcing poor innocent muslim boys to go out and…chop up British soldiers on the streets of London. The balance in the programme was askew. How do we combat Jihad? We recognise it for the Act of Treason that it is. We recognise that the global counter-terrorist war we have (half) been engaged in is a war against the Jihad being waged against us. Whether Jihad is prosecuted against us by violence or by the black propaganda of internal enemy organisations like Cageprisoners, we deal with Treason accordingly, we deal with captured enemy accordingly. Any Muslim who says the West is waging a war against Islam is committing Treason. Any non-Muslim who says the West is waging war against Islam is committing Treason. It is enemy black propaganda. At time of war, aiding and abetting the enemy should lead to immediate incarceration. We should have military tribunals to deal with these incarcerations according to the rules of war. We need to have our own Guantanamo’s. Not just for our domestic jihadists, but for those on the Marxist left and the Jew haters who make common cause with Jihad. After 12 years of being at war, it is time we got up to speed on what being at war means. Unlike Melanie Phillips whom I hugely admire, I have a lot of time for the Prime Minister’s diplomatic hypocrisy over Islam in the wake of the Woolwich Jihad atrocity. There are a lot of British Muslims who practice their religion through the prism of the common humanity that binds us all. The last thing any decent human being wants to see is a violent backlash against innocent British Muslims at the hands of opportunist racists like the EDL. President George W Bush did of course set this great example of restraint and tolerance in the wake of 9/11. However, too much diplomatic hypocrisy leaves us vulnerable. We encourage the enemy to think we are utterly stupid, we encourage ourselves to be utterly stupid. One still marvels that most of the country thinks that when waging a counter-terrorist war there is something wrong with having TPOWs (Terrorist Prisoners of War) in Guantanamo or wheresoever. Who has been at the forefront of fomenting this suicidal idiocy? The BBC. The anti-western narrative of its predominantly left wing news and current affairs coverage of the Afghan and Iraq wars has played directly into the hands of jihad propaganda. Possibly, the best example of the BBC’s complicity with the enemy, is that brainchild of former Guantanamo inmates Moazzem Begg and Binyam Mohamed, Cageprisoners. It could not be more patently obvious that Cageprisoners is a Jihadi propaganda organisation. The best argument in favour of Guantanamo is that Jihadists want to close it down. Moazzem Begg and Binyam Mohamed should be in a British Guantanamo yesterday. BBC journalists like Steve Evans and Angela Saini who do their propaganda work for them should enjoy a nice friendly chat with officers from MI5 on the meaning of Treason, and be left in no doubt that the next time they commit it they’ll be in a jail cell within 24 hours. That’s how wars are fought. If we don’t fight this war we’re in, we’re going to lose it. Had we heeded Churchill’s warnings about Hitler we could have avoided WWII, let’s hope we heed his warnings about Islam before we end up in WWIII. That’s a rather neat summing up of the BBC attitude according to Rod Liddle in the Sunday Times. Something backed up, at least the part about women, by the former Today programme editor Jenny Abramsky who says that the BBC has a ‘huge responsibility’ to employ more women. ‘This is an open letter to a man called James. This particular James is white, middle-aged and public school and Oxbridge educated, and he’s running the important bits of the BBC. All the top people of the BBC are called James and are white and public school and Oxbridge eductaed, except for the Director General, who is white and public school and Oxbridge educated and called Tony. That’s the BBC: No blacks, no dogs, no Irish. No women, either, or very few, nor indeed anyone called “Keith”. Anyway, it is perhaps because they are called James and middle class that they seem terrified of telling the news as it is. If there were a few more people called Tariq or Keith or Harbinger, then there might be a little less tiptoeing on eggshells, less of this absolute terror of giving offence to the people the Jameses definitely are not. In Sweden there are riots…almost all the people doing the rioting were, to adapt Nick Robinson’s phrase, people of non-Swedish orign. These were…are..race riots. Another open thread to kick the week off…the sun is shining, the day is beautiful and the future’s bright….but there is absolutely no connection to Islam I should make clear. The weekend beckons and so time for a brand new fresh and shiny OPEN thread! And guess what, this hasn’t cost £98m…..
Good job we’ve got the BBC then… in touch with popular feeling…on immigration, Europe, welfare, the economy, Islam. Just as well really…I wouldn’t want to be spending £145 a year to fund an organisation that undermines all the values and beliefs I hold, that denigrates and belittles me, that ignores my concerns or treats them with disdain, that has been ‘captured’ by a metropolitan clique that doesn’t know what I think….and wouldn’t care if it did know.